I love designing and planting decorative urns and containers. It’s like designing a small-scale garden, but without the worry about sub-contractors, heavy machinery and delivery trucks. I can indulge in serious plant browsing at the garden centre, make my choices, and put together a stunning miniature garden in no time. Instant bliss! But now it is fall, and time to switch out the tired summer plants for a crisp autumn arrangement. So off I go to buy new plants, only to be faced with the tyranny of the garden centre fall flora. 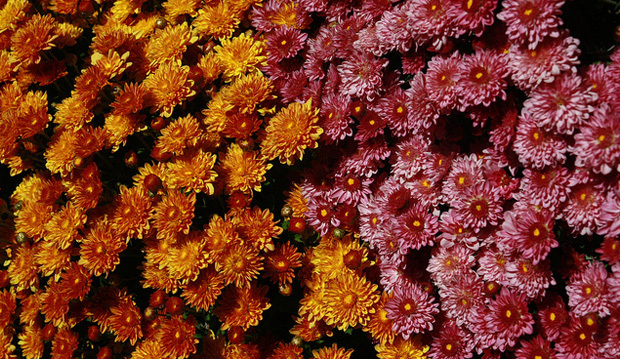 Everywhere you look, you find monstrous, bloated pots of mums only fit for bathtub-sized containers. Plant selections are also limited: the ubiquitous red Pennisetum and millet, ornamental peppers, gourds, kale and cabbage. And who decreed that fall colours must be limited to yellow, purple, orange and red? Gourds and squash don’t have to be orange. Instead of the traditional plant combinations, why not try something more interesting? Mix textures as well as colours for a more sophisticated look. 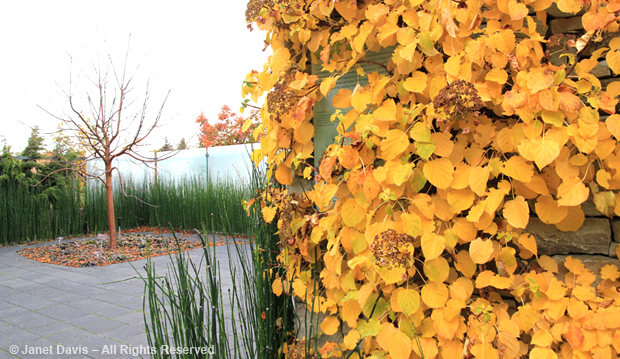 Many plants thrive in autumn’s cooler temperatures and lower light levels. Pansies, snapdragons, and violas provide lots of colour combinations and combine beautifully with the delicate blues, mauves, whites, and dusty pinks of light, airy fall asters. Coral Bells (Heuchera) offer a rainbow of foliage colours from lime green (‘Autumn Bride’), maroon (‘Cajun Fire’) and amber (‘Marmalade’) to glossy black (Obsidian), silver (‘Cinnabar Silver’) and green with silver overlay (‘Green Spice’). The lavender flowers and dark green glossy leaves with dark purple undersides of Plectranthus ‘Mona Lavender’ can be grown from early spring until frost. Combine it with Black Mondo Grass (Ophiopogon planiscapus ‘Ebknizam’), pale pink asters, white Japanese Anemone (Anemone x hybrida ‘Honorine Jobert’) and variegated English Ivy to create an elegant autumn statement. Grasses, kale, gourds and squash in unusual colours and shapes can add pizzazz to your arrangements. White, grey or black squash and striped gourds are attractive placed at the foot of a container. Use a white and green frilly leafed kale or cabbage or a striped grass like Carex ‘Ice Dance’ in your arrangement to echo the colours of striped gourds. Variegated Northern Sea Oats (Chasmanthium latifolium ‘River Mist’) is a grass that has green and white foliage with amazing variegated seed heads. The foliage of Dusty Miller (Senecio cineraria), variegated English ivy and variegated porcelain berry (Ampelopsis ‘Elegans) provide good contrast in colour and shape. The pink and blue porcelain berries are a colourful bonus. Many of these plants won’t be found in garden centres in the fall. The solution? Buy them early in the season and grow them in your garden. They can be transplanted into your container in the fall. At the end of the season, replant them in your garden. And when you are at your favourite garden centre, ask for a better choice in the fall. Consumer demand drives availability. Sara Katz, owner of Wild at Heart Design is an accomplished garden designer and educator who has been designing, planting and writing about gardens since 2000. An avid plant collector, she is a Toronto Master Gardener and a member of the Garden Writers Association. Her articles have appeared in numerous publications, including Canadian Gardening, Canadian Living and Trellis, the magazine of the Toronto Botanical Garden.